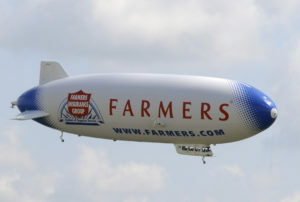 Farmers decided to halt its new Guaranteed Repair Program Scorecard after just six months of evaluating shops using the tool, according to a May email sent to direct repair program facilities. It’s unlikely that the two methods produced identical shop recommendations to consumers, which seems bound to make the change controversial. Some repairers who had adapted to and thrived under the new rules might find themselves suddenly taking a backseat to shops who hadn’t. Conversely, shops who performed well under the old system and wished it hadn’t been replaced by GRP Scorecard in December 2017 might find their prayers answered and their business increasing. The email announcing the switch was dated May 25, just five days before the target June 1 date of the change, which doesn’t seem to give shops a great amount of lead time to react. Regardless of how a shop’s fortunes changed under the switch, the reversal serves as another example of how a carrier might rewrite direct repair program competitive terms and effectively pick new market winners and losers. Farmers did not respond to requests for comment on its resumption of the system it used prior to GRP Scorecard’s adoption in December 2017. 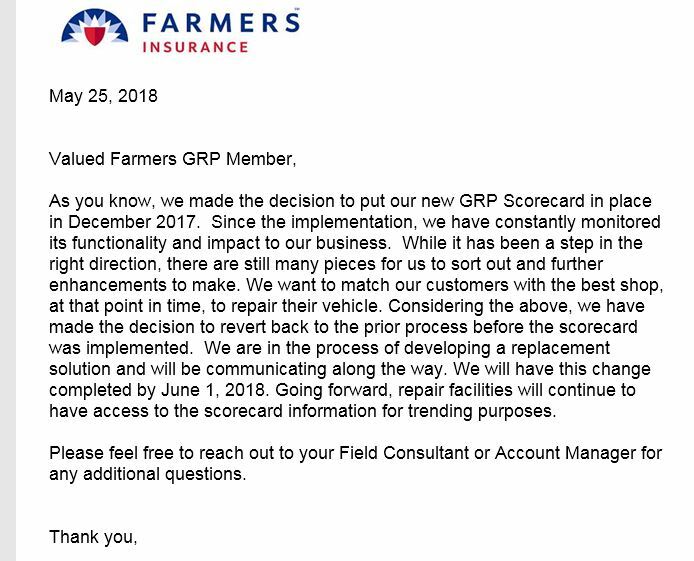 Though Farmers decided to halt use of the GRP Scorecard, it apparently will still let repairers see the information within it. “Going forward, repair facilities will continue to have access to the scorecard information for trending purposes,” the insurer wrote. While CCC declined to comment on the Farmers decision, it did provide some information about its CCC Scorecard product for insurers and DRP shops. CCC Scorecard users include “some of the largest insurers and over 3000 repair shops,” according to CCC — nearly a tenth of the collision repair industry. It allows DRP shops to see how they’re doing, DRP managers to see how the shops’re doing, and insurance executives to see how the DRP managers’re doing. Insurers can pick from nearly 100 KPIs spread among four categories: “Customer satisfaction,” “Cycle time,” “Estimating accuracy,” and “Estimating Quality,” according to Hellyar. “The overall performance score is computed using the insurance company specified area and KPI weighting,” she wrote. CCC Scorecard can be integrated into an insurer’s shop locator system. 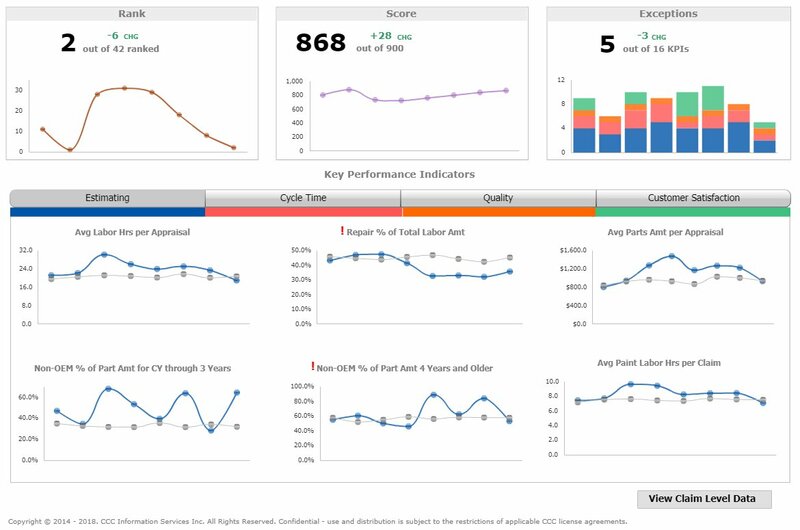 Shops need to be part of a direct repair program to use CCC Scorecard. A different product, CCC Indicators, lets repairers measure their data “relative to industry at the CBSA (core-based statistical area) level” and has existed for more than a decade. However, it might not help unaffiliated shops either. “Like CCC® Scorecard, CCC Indicators is based on uploaded claims from a repairer, therefore a shop would need to be participating in at least one direct repair program to derive value from this tool,” Hellyar wrote. For an even deeper look at CCC Scorecard, see this Jan. 1, 2017, FenderBender feature.